The accordion boot is designed for cabs where you take out the truck window. This product works best with fiberglass shells that are 1/8" to 3/16" thick. Please note that both openings must be exactly the same size for this boot to fit properly. To begin your order just enter the total amount of feet of boot material you need in the appropriate box next to the item you want to order below. Check your entries then click on the "Order Now " button. Accordion boot rubber gasket seal. Replace Your Worn Out Camper Boot Seal with your choice of Accordion Boot Gasket Material. You can get rubber boot material to replace old worn out rubber. 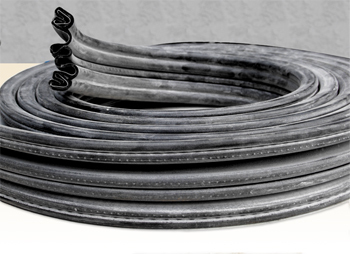 These seals are extruded from a durable EPDM synthetic rubber compound and incorporate a flexible spring steel clip for attachment to any flange. This material is sold by the foot. To determine how much you need measure the distance around your cab opening. You have two choices of rubber to use for sealing your cabs together. Here are the properties of the EPDM Rubber material - Excellent weatherability, good high and low temperature resistance, low gas permeability. Resistant to ozone, steam, water, alcohols, brake fluids. Poor resistance to petroleum oils, diester lubricants. Temperature range: -60°F to 280°F. As you can see this is a superior material for your camper seal. This material is sold by the foot. Unlike other companies that force you to buy more than you need. You get the exact amount you need. No waste. To determine how much you need measure the distance around your cab opening. It is important that both openings are exactly the same size. The average full-size pickup truck rear window opening is approximately 13 - 14 feet around. The average mini-truck is approximately 10 feet around the window opening. You can also click here to use this online calculator to help you determine how much material you require for your project. First you will need to determine how much accordion boot gasket material you need. Just measure around the truck's rear window opening. Once you know how much you need enter that amount in whole numbers in the order form. When you are ready to place your order just click on the "ORDER NOW " button. You will be guided though the order procedure.